Out West, this has not been a great winter for snow sports. 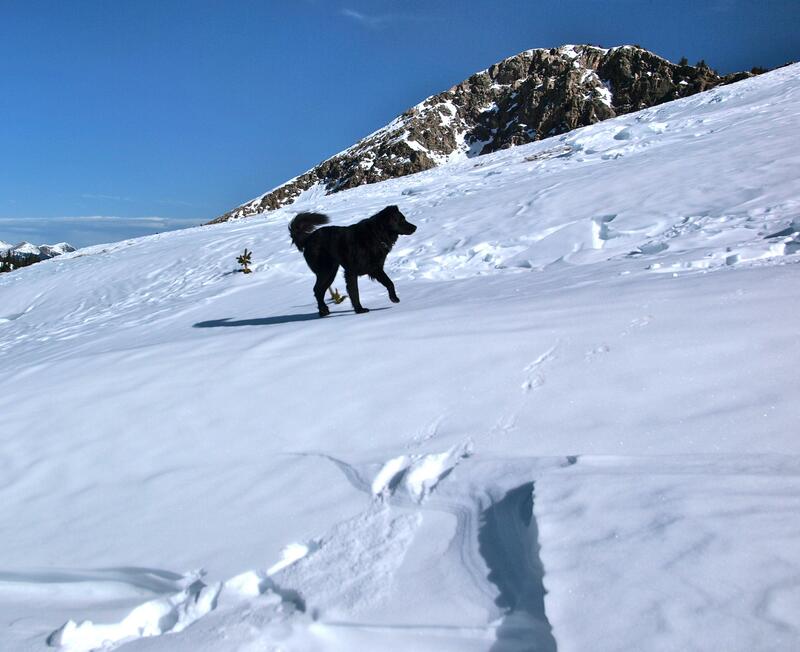 Many of the big ski resorts in Colorado and California got a late start and are still short on natural powder. It’s January and the snowmakers are still working overtime. 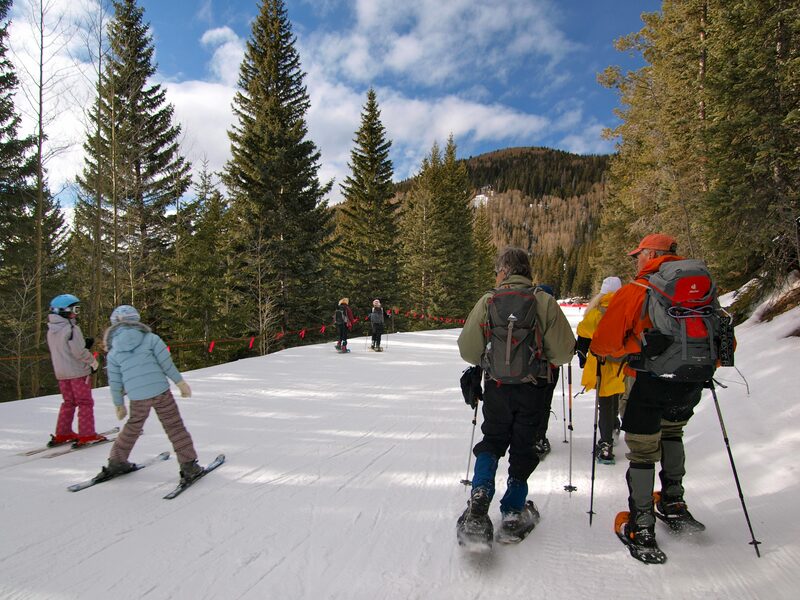 In New Mexico, I hear Ski Santa Fe is having a decent season, although I haven’t yet scraped together the cash for a lift ticket and ski rentals. Yesterday, I hit the slopes above Santa Fe (for free!) 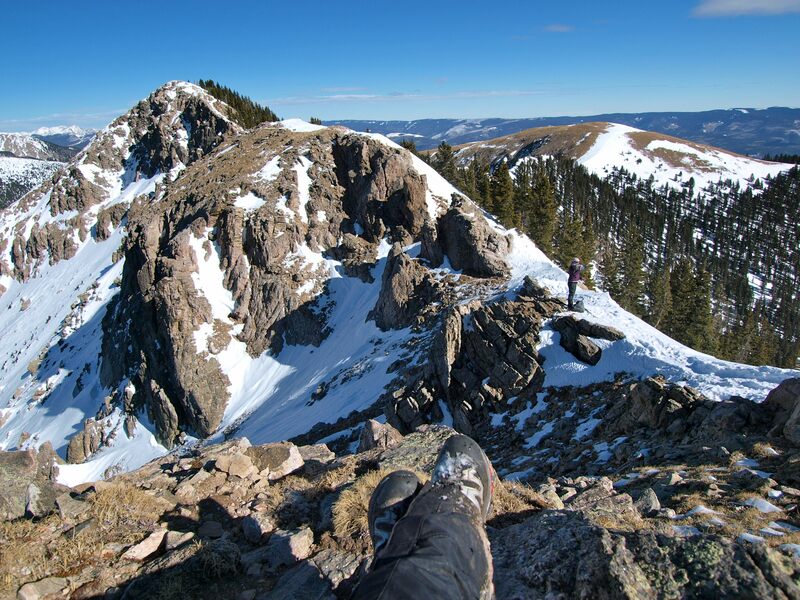 with the Santa Fe Hiking Club for a trek up Ravens Ridge to Deception Peak. 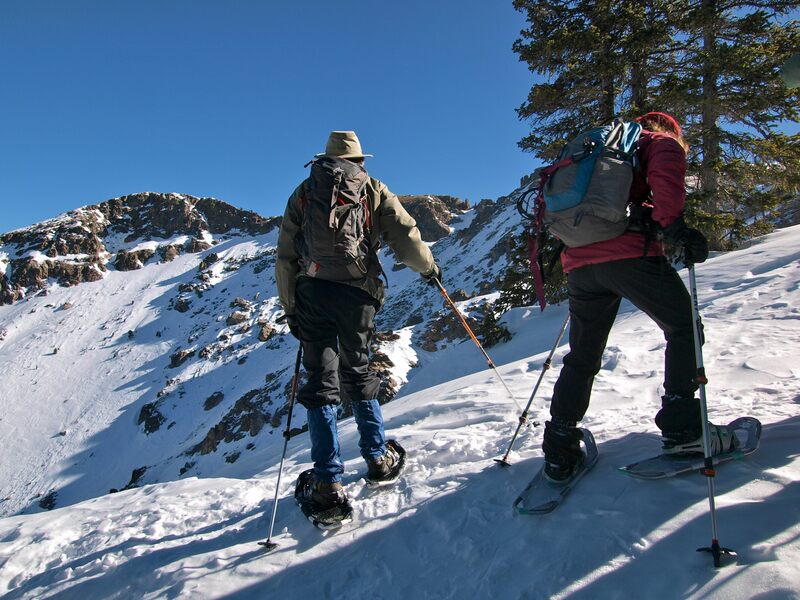 The ski slopes may be short on snow, but the backcountry was resplendent. 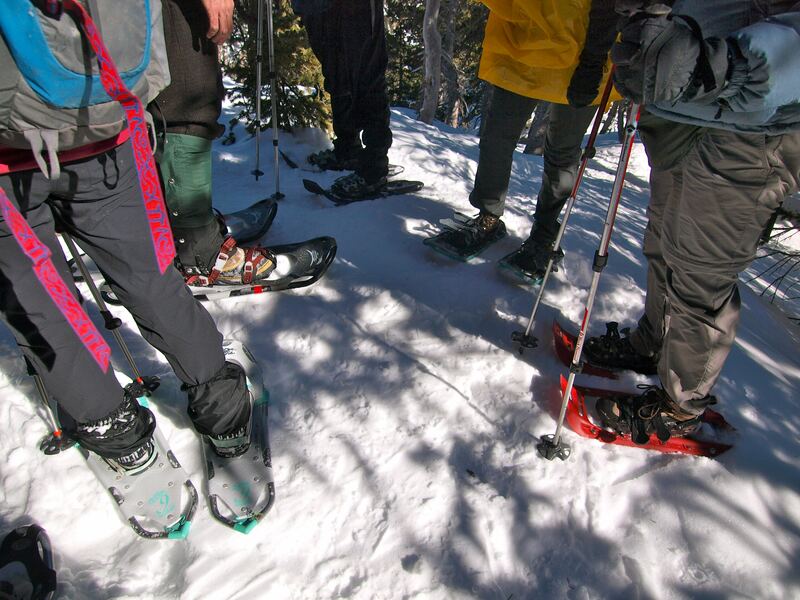 We all wore traction devices like Microspikes and YakTrax for the first mile to the Pecos Wilderness boundary and then donned snowshoes for the off trail climb up the ridge to the peak. Deception Peak D.O.G. 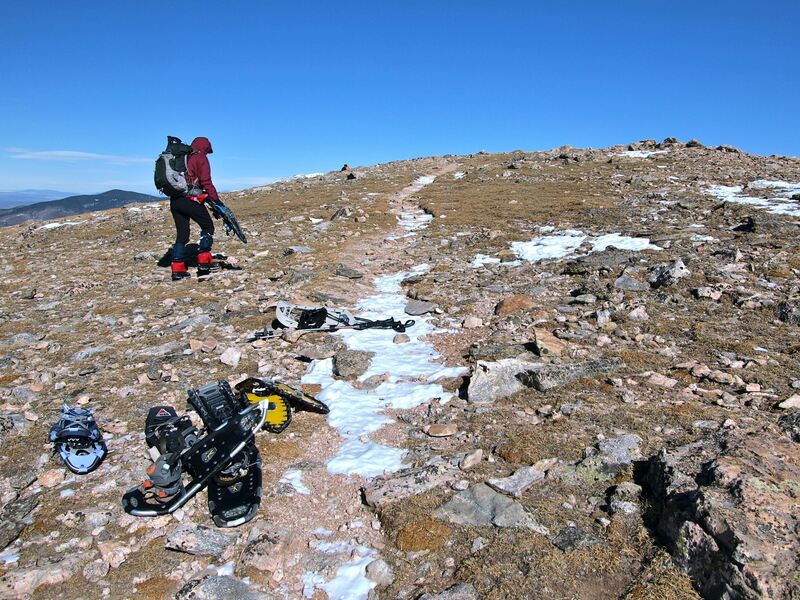 No snowshoes necessary! 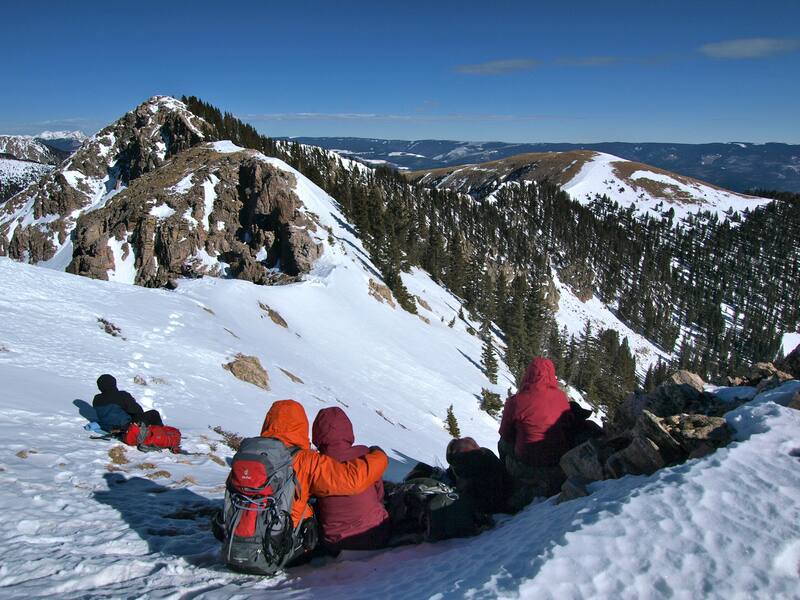 From the summit at 12,360 feet, the views of neighboring Lake Peak, Sante Fe Baldy and the rest of the Pecos Wilderness, as well as Ski Santa Fe and the Rio Grande Valley below were spectacular. It was a lovely clear day and the Sandias, Ortiz and Cerrillos Mountains stood out to the south and the Jemez Mountains and the Pedernal were visible to the north. View points don’t get much better than this! Lunch plans at the summit were quickly cut short due to the insane wind chill. My clementines and my water froze solid and my face and fingers felt like they were next so we ended up retreating a few hundred feet back down to tree line to eat. The descent back down the mountain was a blast: we headed straight downslope, through the trees, in waist-deep unbroken powder. 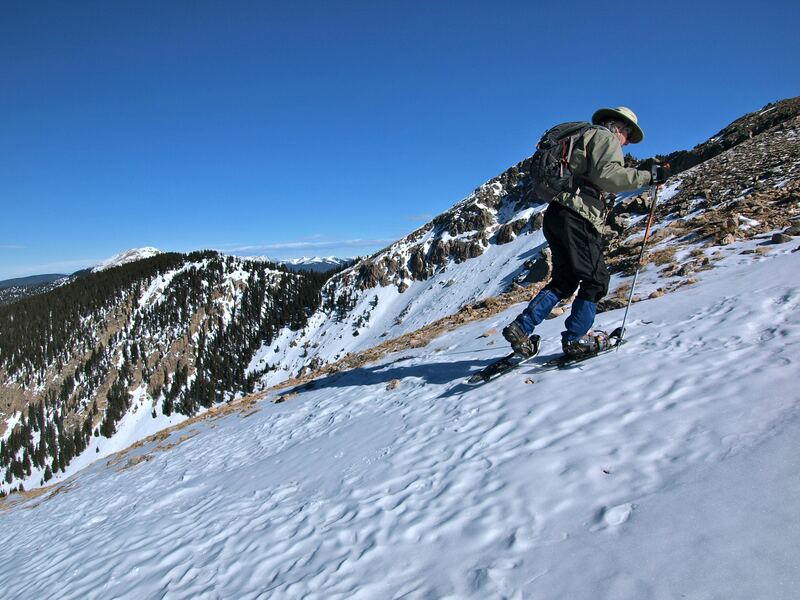 Running down the mountain in snowshoes felt like a cross between skiing and swimming. We all wiped out a few times, but nobody got hurt and there was much laughing and whooping the whole way down. Finally, we emerged on the edge of the Ski Santa Fe bunny slope, where we dodged beginners on skis for a half mile until we hit the parking lot. 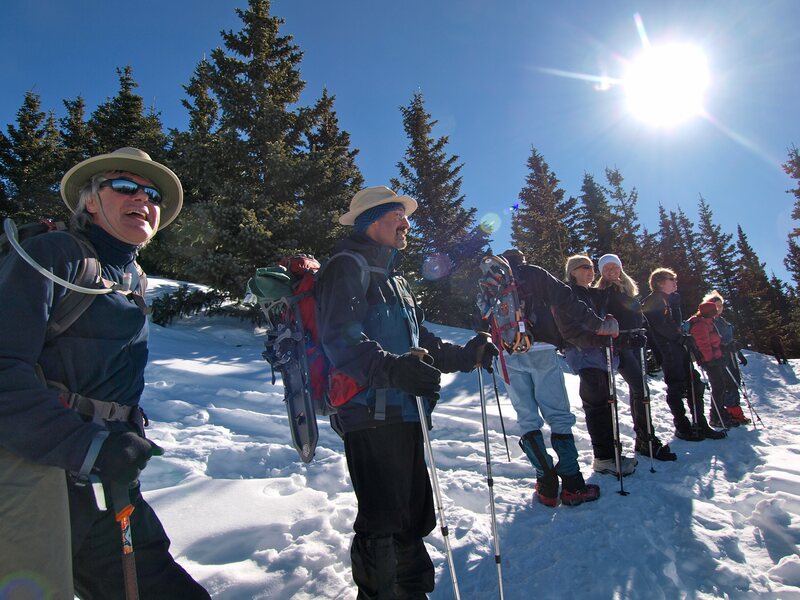 The Santa Fe Hiking Club is organized through Meet Up, an online forum for meeting fellow enthusiasts. Clubs run the gamut from outdoor adventure to foreign language groups to quilting circles. If you have a hobby and are looking to meet other likeminded people, there’s probably a Meet Up for you! I’ve only done a handful of Meet Ups this year: a climb up Placer Peak in the Ortiz Mountains and an overnight to Emerald Lake in Colorado with the New Mexico Backpackers group. I usually hike solo or with one or two close friends and hiking in a big group is a very different kind of wilderness experience. Meet Ups may lack solitude and self sufficiency, but they are a great way to meet fellow mountain people and do things I wouldn’t normally do on my own, like plunge down a mountainside, off trail, in deep snow! If they offer more winter-ascents I’ll definitely sign up! This entry was posted in Bowie & D.O.G., Hiking!, New Mexico, Photography and tagged Deception Peak, Meet Up Groups, Pecos Wilderness. Bookmark the permalink. Great pictures, sounds like a big, big climb to me. Keep them coming, love reading about your adventures.